Vigo Street (originally Vigo Lane) is a short street in central London that is named after the Anglo-Dutch naval victory over the French and Spanish in the 1702 Battle of Vigo Bay. It has important literary connections. 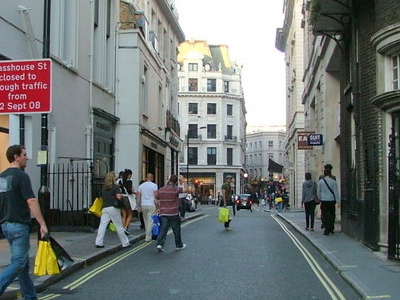 The street runs between Regent Street and the junction of Burlington Gardens and Savile Row. Sackville Street leads south, half way along Vigo Street. The rear entrance to Albany is wedged between the end of Vigo Street and the start of Burlington Gardens at 10 and 12 Burlington Gardens. Here's the our members favorite photos of "Famous Streets near City of Westminster". Upload your photo of Vigo Street!